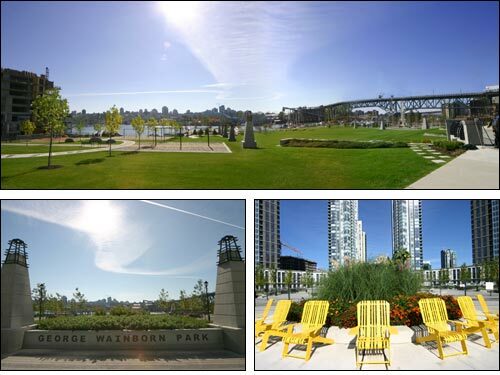 Vancouver’s newest jewel of a waterfront park is open! George Wainborn Park is located downtown off Pacific Boulevard at the foot of Richards Street. The beautiful 2.5 hectare park boasts formal and informal spaces, expansive lawns, a dramatic water feature and spectacular views of False Creek and the city. Highlights of the $5.1 million park’s upper section includes the large circular water feature replicating water moving through the natural B.C. environment, surrounded by grass, formal plantings and benches. Seven specially designed bright yellow, steel Adirondack chairs on the upper promontory look out over False Creek. The lower section features a large rambling lawn with informal tree plantings, a colourful children’s play area with slides and swings, a serpentine walkway leading to the seawall, a bosque of birch trees with seating, and a promontory overlooking the water’s edge. The park is named for Vancouver’s longest serving Park Commissioner, George Wainborn, who contributed to the City’s parks and recreation system for 33 years between 1956 and 1990. Among his many accomplishments, Wainborn was a leader in the creation of Stanley Park’s Miniature Railway, played a key role in starting the Carol Ships program, and initiated lighting of the magnificent grove of elm trees on Beach Avenue at Bidwell each Christmas season. A recipient of the Freedom of the City in 1991 and Order of Canada in 1999, he died in September 2003. Seawall users will continue to use the existing routes through and around the park until adjacent construction is completed. An official opening celebration of George Wainborn Park is planned by the Park Board and Concord Pacific for later this Fall.